I like this street corner. For a night in Toronto, I really didn’t have much of a clue about where to eat. Finally, a buddy of mine told me to check out the Mill Street Brewery. I am always up for a microbrewery since that seems to be a lost art in LA, so I looked it up. It turned out that the place was actually pretty easy walk from our hotel, so we headed to Mill Street to see what we could find. After a twenty minute walk through a mildly sketchy part of town featuring a homeless pirate watering plants with a two-liter of Canada Dry, we arrived at the Distillery area. This part of town was once some sort of huge brewery, but now had shops, restaurants, bars and people testing Smart Cars and Segway Scooters. Even before we started drinking, our goal was to take a drunken ride on/in one of these (no, we did not achieve our goal). 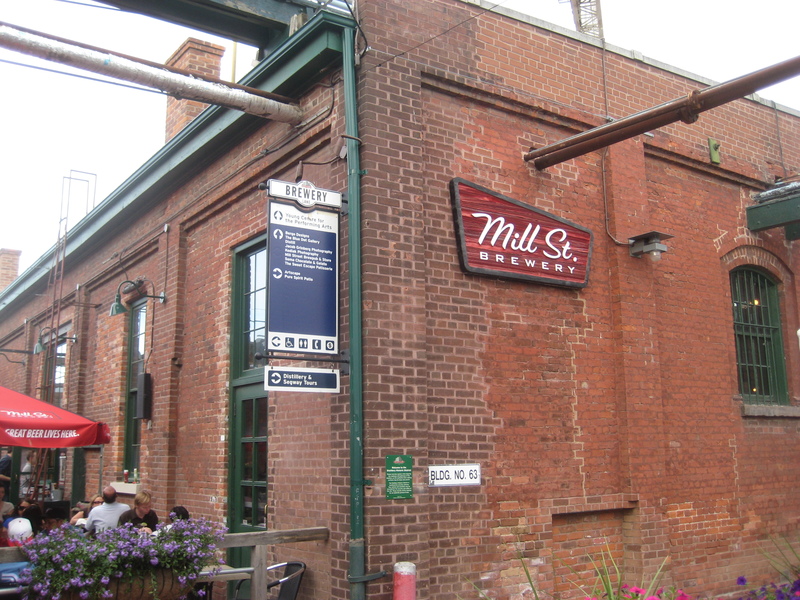 When we got to the Mill Street Brewery, we found that there was about an hour wait. No worries, we were at a brewery and needed some beer before doing anything else anyway. We sidled up to the bar and started to test out their beers. Before we were even seated, I downed their Helles Bock, Tankhouse Ale and Stock Ale. The Tankhouse was my favorite, although the Helles Bock was also pretty good. They had a good amount of options, including rotating taps, so I could definitely see myself returning and having a whole different experience. After about an hour, the table was ready and we took our seats. A look at the menu revealed some good microbrewery food. Hoping to have a Grizzly Peak-style experience, I set my sights on their burgers. 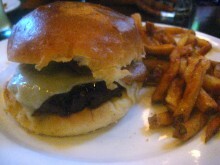 Of these, the Distillery Burger looked the best to me. It came with Mill Street Coffee Porter BBQ sauce, crispy pancetta, Swiss cheese and crispy onions, which sounded great except for those dastardly onions. This could really soak up some beer. 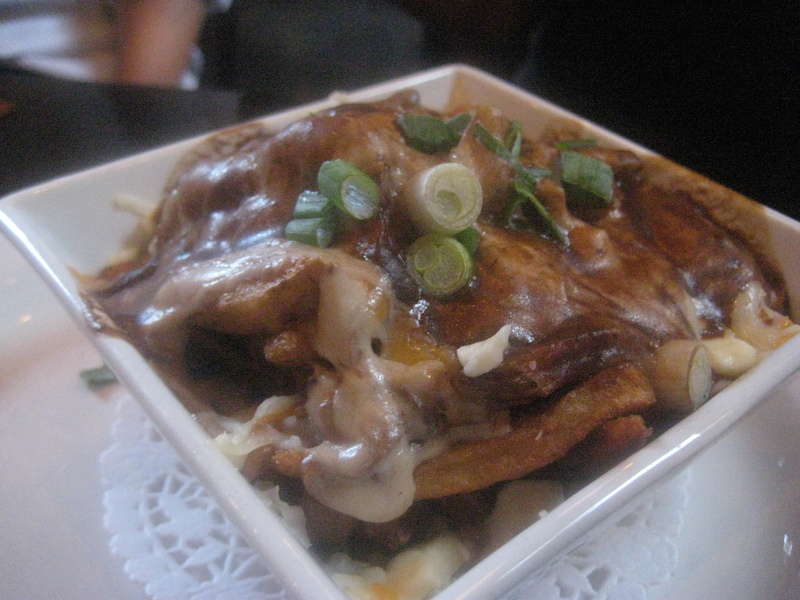 There was also something on the menu that I wasn’t sure I’d be able to get in Toronto: poutine. Poutine is definitely more of a French-Canadian specialty, so we weren’t sure if it would be any good, but we ordered it anyway as an appetizer. Mill Street had put a bit of bit of a brewhouse twist on the poutine, called Pulled Short Rib Poutine. It was made with fries, alfredo, Tankhouse Ale braised Angus short ribs, green onions, Ontario cheese curds and gravy, of course. I couldn’t convince my compatriots to get it without the green onions, so when it came I had to dig around with my fork to avoid them. The poutine here was pretty good, but it wasn’t poutine in its truest form. The cheese curds were fully melted by the time it got to the table and the gravy was thick and had soaked through the fries so much that it was pretty much an amorphous blob of gravy, cheese and potatoes. The ribs seemed kind of out of place, although it tasted just fine. When the main course came, I was glad to see it had been made without vegetables like I asked. You never really now how an unvegan is going to be received in a foreign country. Sadly, despite being free of vegetables, this burger could have used a bit of work. It was a bit overcooked and quite dry. This could have been somewhat compensated for if there had been a lot of BBQ sauce in between those buns, but there just wasn’t enough of that sauce on it. This was too bad, because if it weren’t for this patty, it could’ve been a damn good burger. Mill Street Brewery was a cool place in a cool part of town, but go for the beer, not for the burgers.